Wu, J. (2014). Effects of learning styles on self-directed foreign language vocabulary learning. Studies in Self-Access Learning Journal, 5(2), 112-126. Vocabulary learning is an on-going and life-long process, which is greatly influenced by individual differences. 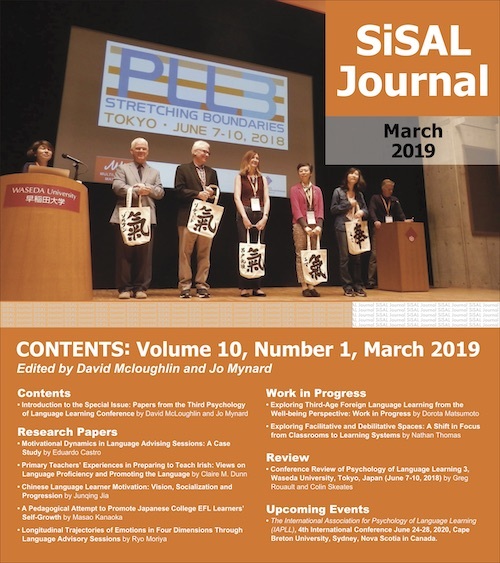 It has been noted that there is inefficient self-directed FL vocabulary learning of college students in mainland China and non-individualized learning may be one of the major reasons. As one of the most significant individual differences, a student’s learning style is supposed to largely determine their selection of learning strategies and have an effect on learning outcomes. This paper focuses on categorizing diversified vocabulary learning tasks which activate various vocabulary learning strategies, and integrating them into a learning system along particular learning paths to cater for different learning styles. The system is also tested in an empirical study for the purpose of checking the effects of these learning paths. As an on-going and life-long process, vocabulary learning is strongly influenced by individual differences (Kojic-Sabo & Lightbown, 1999). Students’ individual differences refer to the differences in age, attitude, intelligence, language proficiency level, learning style etc. These differences should be taken into account when teaching and learning processes are being planned. However, some studies (e.g. Li, 2010; Liu & Zhang, 2005; Wang, 2002; Wu & Wu, 2008; Xu, Peng, & Wu, 2004) indicate that college students in mainland China depend too much on their teachers and are used to being passive recipients, resulting in a serious lack of autonomy. The majority of those students engage mostly in rote memorization with word lists and decontextualized mechanical drills in self-directed vocabulary learning (Chen, 2001; Wu, 2011). Such non-individualized vocabulary learning may neither encourage students to utilize various vocabulary learning strategies nor stimulate their interest and motivation, and this is thus assumed to be one of the main reasons for their frustration in self-directed vocabulary learning. In this research, learning style will be particularly targeted as one of the most salient individual features. During the research, material which included different learning paths catering for students’ different learning styles was trialed to see whether there was any improvement with students’ self-directed vocabulary learning by using it. Dunn and Dunn (1992, 1993, 1999) described learning styles as “the way in which each learner begins to concentrate on, process, absorb, and retain new and difficult information” (as cited in Pashler, McDaniel, Rohrer, & Bjork, 2008, p. 107). Learning styles have also been defined as “an individual’s natural, habitual, and preferred ways of absorbing, processing, and retaining new information and skills” (Reid, 1995, p. viii) and “how elements from basic stimuli in the current and past environment affect an individual’s ability to absorb and retain information” (Henson & Eller, 1999, p. 505). 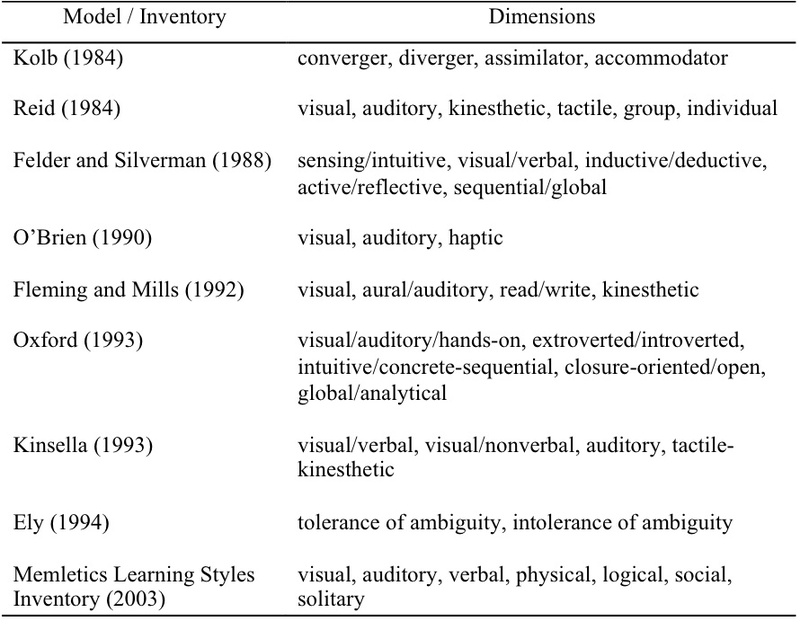 Different learning style models or inventories (Table 1) have been created in the past few decades. Regarding the effect of learning styles on learning outcomes, the learning-style hypothesis or the meshing hypothesis is evidently engrained in the educational practice of researchers who are interested in learning styles. The theory of learning styles suggests that “instruction should be provided in the mode that matches the learner’s style” (Pashler, McDaniel, Rohrer, & Bjork, 2008, p. 108). In other words, many researchers insist that customized learning to students’ learning styles can allow them to achieve better learning outcomes. For instance, Ford and Chen (2001) support that learning in matched conditions, in which instructional strategies are matched with learners’ learning styles, is significantly more effective than that in mismatched conditions in certain contexts. Omrod (2008) claims that verbal students seem to learn better when information is presented through words while visual students seem to learn better when it is presented through pictures. However, there is also some evidence that contradicts these assumptions, showing that learning may not be improved by adjusting learning based on learning style. For example, Constantinidou and Baker (2002) find that there is “no relationship between a visual learning style and the actual learning of verbal items that are presented visually or auditorily” (p. 306). Massa and Mayer (2006) report that their study provides no support for the idea that different instructional methods should be adopted for visualizers and verbalizers. In sum, it is inconclusive whether learning styles have an effect on learning outcomes. Although it is difficult to realize individualized learning in a classroom setting, it may be more easily achieved through CALL. CALL derives from Computer-assisted Instruction (CAI). It is interdisciplinary, that is, it is tightly connected to other disciplines such as cognitive psychology, artificial intelligence, course design, human-computer interaction and SLA. It refers to “the search for and study of applications of the computer in language learning and teaching” (Levy, 1997, p. 1) or “learners learning language in any context with, through, and around computer technologies” (Egbert, 2005, p. 4). From the 1990s to the present day, CALL has developed very rapidly and has been greatly influenced by constructivism. This has meant that the integrative phase of CALL is characterized by the use of multimedia, hypermedia and interactive technologies to promote integration of language learning skills. The adaptive nature of CALL allows students to control their learning environment and select the options best suited for their learning style preferences (Grace, 1998). Therefore, to address different learning styles, an adaptive and intelligent learning system was developed for the purpose of this preliminary research. Vocabulary learning tasks were categorized and integrated into a system according to particular learning paths, depending on different learning styles. It is proposed to enhance students’ utilization of various vocabulary learning strategies and create an effective individualized learning environment. To cater for different learning styles, different learning paths indicating those styles have to be built in the intended system. However, it seems impossible to address all the learning styles in Table 1 above. After careful selection, the Memletics Learning Styles Inventory (2003) was consequently adopted for this study because it stresses several of the most salient learning styles and it is precisely defined and widely accepted. The inventory includes seven learning styles, i.e. visual, aural, verbal, physical, logical, social and solitary, but four of them are not taken into account in this research: The verbal style is excluded because this study is related solely to word learning. The physical style is also not considered because it is relatively difficult to address even in a computer-based learning environment. Additionally, because both individual and social activities are very conducive to self-directed vocabulary learning according to the importance of independence and interdependence in learner autonomy, the activities for the social and solitary styles are provided for all the students. As a result, the three remaining styles, i.e. visual, aural and logical are introduced to underlie different learning paths in the intended system. A visual-style learner prefers using images, pictures, colors, and maps to organize information and communicate with others; an aural-style learner likes to work with sound and music; and a logical-style learner likes using his brain for logical and mathematical reasoning. In the learning paths, besides most learning tasks addressing a major style among the three, several tasks cater for both visual and aural styles due to their significant prominence in those tasks. What is more, since a few tasks are indispensable to the basic acquisition of new word knowledge, they are hopefully adopted by students of all styles and thereby included in all learning paths. A self-directed vocabulary learning system called Learning Vocabulary In Domain was ultimately developed (Figure 1). In the system, three learning paths addressing different learning styles, i.e. visual, aural and logical, were built up with the learning tasks activating various vocabulary learning strategies to hopefully facilitate students’ utilization of these strategies, thereby improving their self-directed vocabulary learning. Upon logging into the learning system at the first time, students are presented with a questionnaire page about learning styles (Figure 2). In the questionnaire, three choices are initially offered for students: zero (The description sounds nothing like you), one (The description sounds partly like you) and two (The description sounds exactly like you). Then, the descriptions for the three learning styles are arranged in a random order. After students fill out the questionnaire, the learning style that most fits them is reported to them immediately. More importantly, the result leads students automatically to the task page, which displays vocabulary learning tasks that match their learning style. 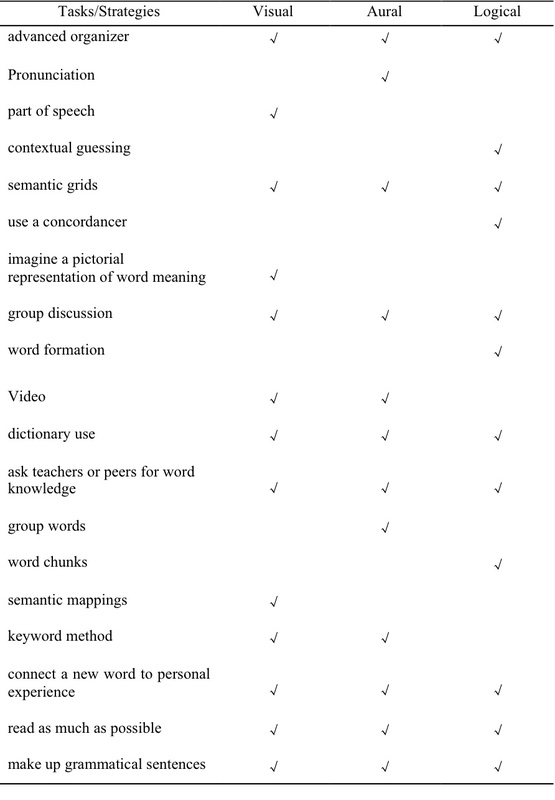 On the task page (Figure 3) of each individual word, learning tasks working for the justified systematic vocabulary learning processes (Wu, 2012) are first categorized sequentially for students’ more effective vocabulary acquisition. Then, the learning paths addressing different learning styles, i.e. visual, aural and logical, are also provided in options for students. The default path is determined by the result of the aforementioned questionnaire survey on learning style. The tasks in each learning path are shown below (Table 2), which activate various vocabulary learning strategies. An empirical study was conducted to discover whether the application of learning paths addressing different learning styles in computer-assisted vocabulary learning could significantly improve college students’ self-directed vocabulary learning. Then, two kinds of computer-assisted learning environments were created. In the first environment, students used a vocabulary learning system that embeds different learning paths with matched learning tasks (S1), i.e. 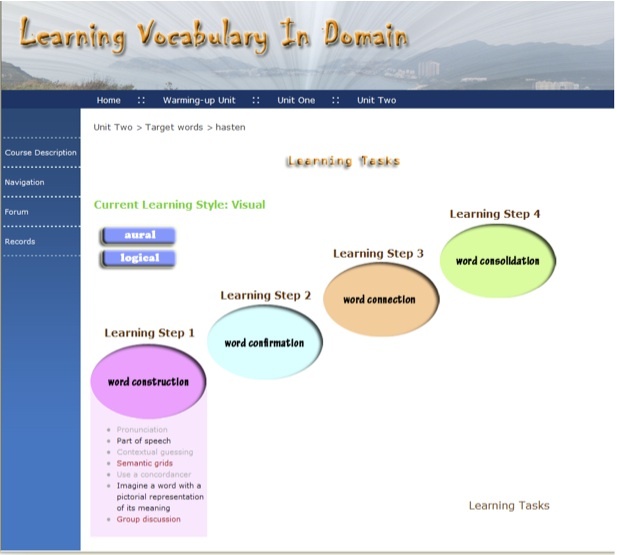 Learning Vocabulary In Domain, and in the second environment, students adopted a system that displays the same tasks but does not indicate any learning paths (S2). The research question was expectedly answered by the comparison between students’ performance in the two environments. The participants in this study were 61 freshmen from a science and engineering university in mainland China. They were all non-English majors selected from about 4,000 freshmen randomly. 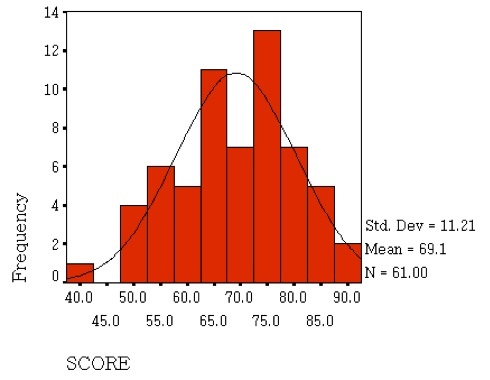 The distribution of their English scores in the placement test which was held immediately after their college entrance is shown in Figure 4. As can been seen from the histogram, although it skewed to the left (skewness value=-0.340<1), the skewness was not very strong. Therefore, to a great extent, the participants selected could represent all the students in that grade, and on a larger scale, those at similar science and engineering universities in mainland China. For the purpose of answering the research question, the participants were divided into two groups and then randomly assigned to study on self-directed vocabulary learning systems S1 and S2 respectively. For the validity of the research outcome, the English scores of the two groups in the placement test were compared. The results in Table 3 revealed that the mean score was 68.67 (SD = 10.13) for the S1 group and 69.61 (SD = 12.32) for the S2 group. These group means were tested usingIndependent samples t-test, and this difference was found to be non-significant, t (59) = -.327, p = .745. It implied that the two groups were at a similar language proficiency level before the start of the experiment. In addition, students’ performance on the target words in the pre-test was also compared between the two groups. As shown in Table 4, the mean score was 18.90 (SD = 7.49) for the S1 group and 19.19 (SD = 6.41) for the S2 group. Using the Independent samples t-test, there was no detectable difference, t (59) = -.165, p = .870. Meanwhile, the students in both groups were found to be unfamiliar with the target words. From the comparisons above, it is clear that the two groups were qualified to participate in the experiment. Three vocabulary tests, namely the pre-, post- and delayed post-test were designated as the instruments to compare students’ performance. The participants were not informed in advance of the post-test immediately after the treatment nor the delayed post-test two and a half months after the treatment. Therefore, the two tests were designed to be almost the same as the pre-test, with some changes only in the sequence of question items. The test mainly checks the participants’ vocabulary knowledge in three essential aspects, i.e. word form, meaning and usage. It is composed of five parts: 1) Dictation; 2) Choose the correct spoken forms of target words and write out their L1 translations; 3) Find the synonyms of target words; 4) Fill the gaps of contextual sentences with target words; and 5) Make up grammatical sentences with target words. For the purpose of guaranteeing the validity and reliability of this test, two experts in language testing were invited to check it and six college students took the test prior to the participants. It was then revised accordingly. The three vocabulary tests were carried out on the two participating groups before, immediately after, and two and a half months after the treatment. Each test lasted about 45 minutes. 61 valid test papers were collected for each test. The papers were scored according to the scoring criteria. Then, all the raw data collected from the tests were analyzed using SPSS. Cronbach’s α was employed to test the level of reliability within the post-test. The result indicated an acceptable reliability (α=0.779). Comparisons were made between the two groups based on their performance in the three tests to discover whether the application of learning paths in computer-assisted vocabulary learning could significantly enhance students’ self-directed vocabulary learning. Firstly, the gain scores from the pre-test to the post-test were compared between the two groups by Independent samples t-test to see whether the gain scores of the group engaging in system S1 were significantly higher than those of the group studying on system S2 after the treatment. Secondly, the gain scores from the pre-test to the delayed test were compared in the same way to find out whether the students using system S1 still achieved significantly higher gain scores two and a half months after the treatment. The experiment lasted eight weeks including one training week, five learning weeks and two assessment weeks. In the training week, a tutor explained the use of the designated systems to the two groups. During the five learning weeks, the two groups were required to study using their respective systems twice a week, one hour each time in the Learner Autonomy Center (LAC) for Language Studies. During the assessment weeks, vocabulary tests were conducted. The results of the gain scores from the pre-test to the post-test between the two groups are displayed in Table 5. The mean score (86.87) for the group using the system which embedded different learning paths with matched leaning tasks (S1) was larger than that (84.71) for the group taking the system which displayed the same tasks but did not indicate any learning paths (S2) immediately after the treatment. However, this could not justify that the difference was significantly large. Then, these group means were tested usingIndependent samples t-test, and the difference was found to be non-significant, t (59) = .844, p = .402. It indicated that no detectable difference could be found between the gain scores of the two groups over the treatment period. According to the results of the students’ gain scores from the pre-test to the delayed post-test between the two groups in Table 6, the mean score (80.40)for the group utilizing system S1 was larger than that (77.32) for the group adopting system S2 two and a half months after the treatment. However, the Independent samples t-test value for the difference between the two groups was still non-significant, t (59) = 1.202, p = .234.It meant that there was still no detectable difference between the gain scores of the two groups two and a half months after the treatment. Based on the analysis and discussion above, a trend was shown that system S1 was not significantly more effective in helping participants gain target word knowledge than system S2. In other words, the application of learning paths addressing different learning styles in computer-assisted vocabulary learning could not significantly improve their self-directed vocabulary learning.On one hand, it may be revealed that tailoring students’ self-directed vocabulary learning to their learning styles has no effect on learning outcomes as other studies (Constantinidou & Baker, 2002; Massa & Mayer, 2006) have reported. As further mentioned in a research study (Pashler, McDaniel, Rohrer, & Bjork, 2008), “… at present, there is no adequate evidence base to justify incorporating learning-styles assessments into general educational practice” (p. 105). On the other hand, the non-significant outcomes may possibly result from a few factors like the time span of the treatment and the number of target words involved in the preliminary study. A longitudinal study with a longer period of treatment for students may lead them to interact more with different learning paths in the system. Moreover, with a larger number of target words in the longitudinal study, it can enable researchers to collect a broader range of data and thereby probe into more accurate details of computer-assisted self-directed vocabulary learning in different learning paths. Nowadays, most college students in mainland China lack learner autonomy and learn words by rote memorization and mechanical practice, seldom consciously focusing on which tasks they choose. It is expected in this preliminary study that they can select those tasks based on their individual differences, especially with respect to learning styles. With the rapid development of computer technology and its wide applications in language teaching and learning, individualized learning may be more easily achieved by CALL. 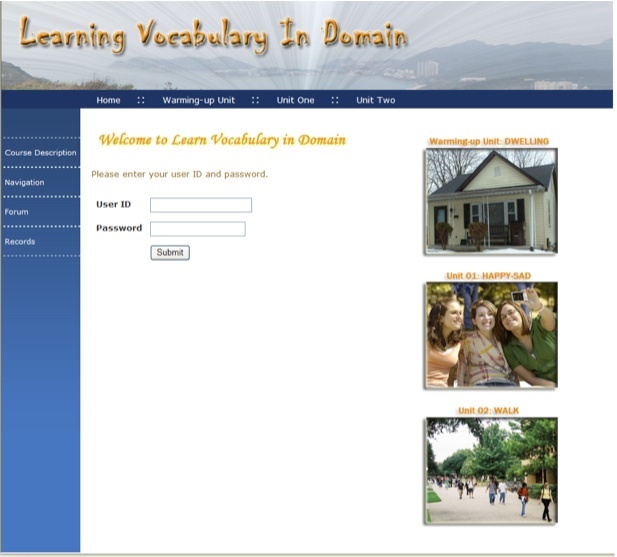 Therefore, in this research, a self-directed vocabulary learning system called Learning Vocabulary In Domain was developed to address students’ different learning styles. Then, an empirical study was conducted to test whether the group using this system could perform significantly better than that taking the system which displayed the same tasks but did not indicate any learning paths, and as a result no significant difference was detected in students’ performance between the two groups either immediately after or two and a half months after the treatment. The results show that there is no solid evidence to support the efficacy of learning styles on learning outcomes as some studies have already indicated. However, the non-significant results could possibly have been caused by the limitations in the preliminary study such as the time span of the treatment and the number of target words. Therefore, more subtle details of computer-assisted self-directed vocabulary learning in different learning paths could be explored in future research. Jing Wu is a lecturer in the College of Foreign Languages and Literatures at Fudan University in China. Her research interests include computer-assisted language learning (CALL), EFL learning and teaching, vocabulary acquisition and self-directed learning. The research is sponsored by the Chinese MOE Youth Funds for Research in Humanities and Social Sciences (Grant No: 12YJC740111) and the Fundamental Research Funds for the Central Universities in China. Chen, H. (2001). Chinese non-English majors’ strategies for English vocabulary learning. Foreign Language Education, 22(6), 46–50. Egbert, J. (2005). Conducting research on CALL. In J. Egbert & G. M. Petrie (Eds. ), CALL research perspectives, (pp. 3–8). Mahwah, NJ: Lawrence Erlbaum Associates. Ely, C. M. (1994). Second language tolerance of ambiguity scale. In J. M. Reid (Ed. ), 1995, Learning styles in the ESL/EFL Classroom, (pp. 216–217). Boston, MA: Heinle & Heinle. Felder, R. M., & Silverman, L. K. (1988). Learning and teaching styles in engineering education, Engineering Education, 78(7), 674–681. Fleming, N. D., & Mills, C. (1992). Not another inventory, rather a catalyst for reflection. To Improve the Academy, 11, 137–155. Grace, C. (1998). Personality type, lexical ambiguity, and vocabulary retention in CALL. CALICO Journal, 15(1–3), 19–45. Henson, K. T., & Eller, B. F. (1999). Educational psychology for effective teaching. Belmont, CA: Wadsworth Publishing. Kinsella, K. (1993). Perceptual Learning Preferences Survey. In J. M. Reid (Ed. ), 1995, Learning Styles in the ESL/EFL Classroom, (pp. 221–231). Boston, MA: Heinle & Heinle. Kojic-Sabo, I., & Lightbown, P. (1999). Students’ approach to vocabulary learning and their relationship to success. The Modern Language Journal, 83(2), 176–192. Kolb, D. A. (1984). Learning style inventory and technical manual. Boston, MA: McBer and company. Li, H. H. (2010). Study on autonomous learning abilities of non-English major freshmen and their psychological factors. Exam Weekly, 2, 98–100. Liu, G. L., & Zhang, W. G. (2005). An investigation and analysis of college students’ foreign language autonomous learning. Journal of Xi’an International Studies University, 13(4), 38–40. Memletics­­ Learning Styles Inventory. (2003). Retrieved from http://www.memletics.com. O’Brien, L. (1990). The Learning Channel Preference Checklist. In J. M. Reid (Ed. ), 1995, Learning styles in the ESL/EFL classroom, (pp. 196–201). Boston, MA: Heinle & Heinle. Ormrod, J. E. (2008). Educational psychology: Developing learners (6th ed.). Upper Saddle River, NJ: Pearson. Oxford, R. (1993). Style Analysis Survey (SAS): Assessing your own learning and working styles. In J. M. Reid (Ed. ), 1995, Learning styles in the ESL/EFL Classroom, (pp. 208–215). Boston, MA: Heinle & Heinle. Reid, J. M. (1984). Perceptual Learning Style Preference Questionnaire. In J. M. Reid (Ed. ), 1995, Learning Styles in the ESL/EFL Classroom, (pp. 202–207). Boston, MA: Heinle & Heinle. Reid, J. M. (1995). Learning styles in the ESL/EFL classroom. Boston, MA: Heinle & Heinle. Wang, D. Q. (2002). Fostering learner autonomy in college English study. Foreign Language World, 5, 17–23. Wu, J. (2011). Study on college students’ utilization of vocabulary learning strategies. Fudan Forum on Foreign Languages and Literature, Spring, 84-89. Wu, J. (2012). Construction, specification and validation of a new framework of vocabulary learning processes. Fudan Journal of the Humanities and Social Sciences, 5(4), 116–137. Wu, J., & Wu, Z. J. (2008). The cognition of self-directed learners under CALL. Modern Educational Technology, 18(5), 37–41. Xu, J. F., Peng, R. Z., & Wu, W. P. (2004). Survey and analysis on college non-English majors’ autonomous English learning ability. Foreign Language Teaching and Research,36(1), 64–68.